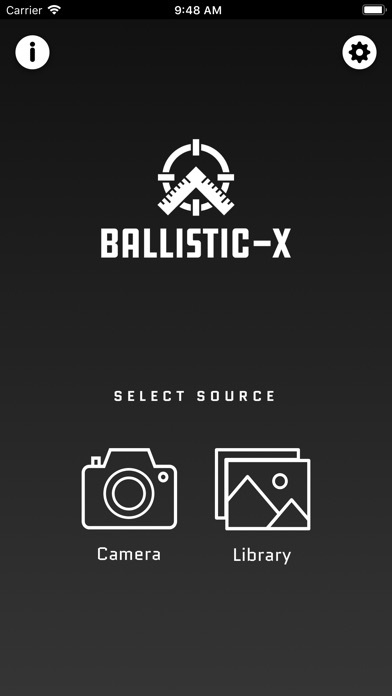 Ballistic-X is the easiest way to calculate shot groups and to Zero a rifle! 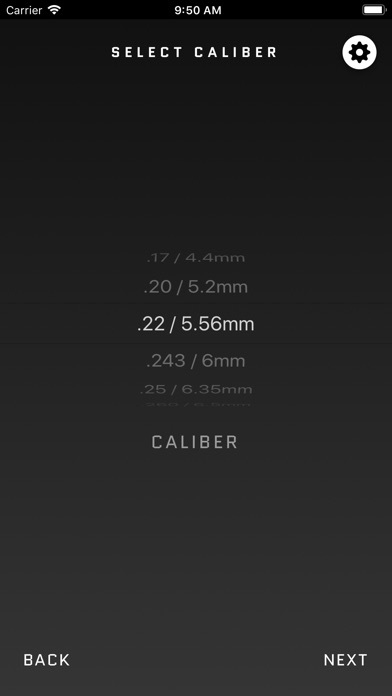 Designed by shooters, the simple and intuitive interface allows user to setup their own parameters via our settings menu. Options includes MOA/MIL, Imperial/Metric, and will work with any target including Steel. BX also offers useful data and labeling options that aid in Load Development. 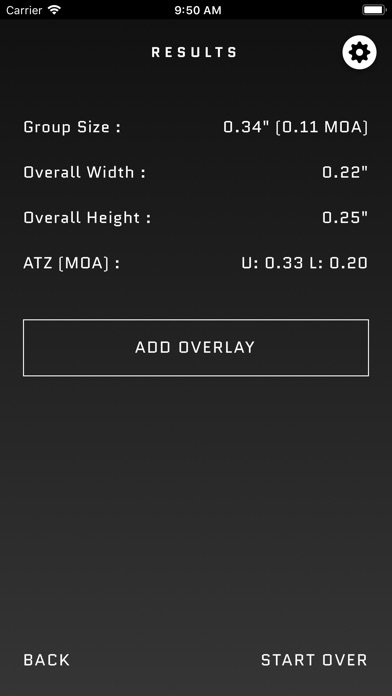 ATZ (Adjustment To Zero) feature tells shooter how much to adjust turrets to bring rifle to Zero, allowing a perfect zero with fewer rounds shot. 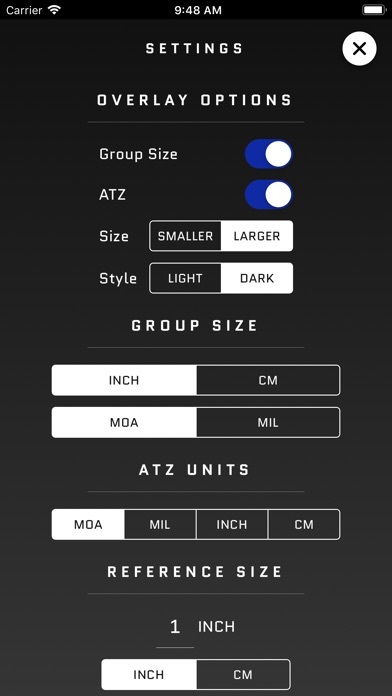 ATZ works dynamically at any range and is compatible with all turret options! 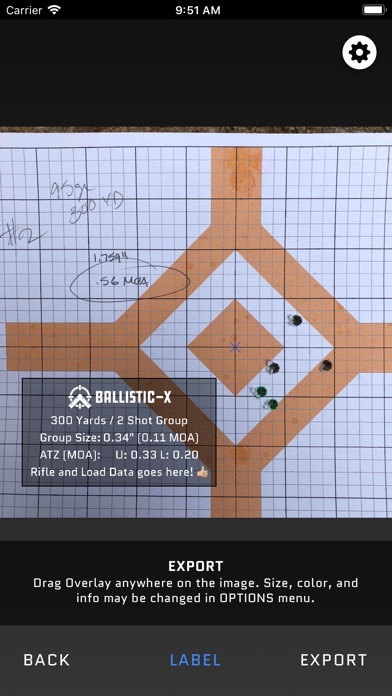 Workflow is simple: - Take image of Target (within App or from Library) - Designate reference size in settings menu - Mark the two points on target which coincide with reference (grid target or steel target) - Input distance from Target - Mark Point Of Aim and Impacts - Add Overlay, Label, and Export - Adjust Optic according to ATZ Ballistic-X is a community driven App committed to the best user experience possible along with customer service second to none! I have 1 request for next update. Could you please have a option to change color when marking impacts. 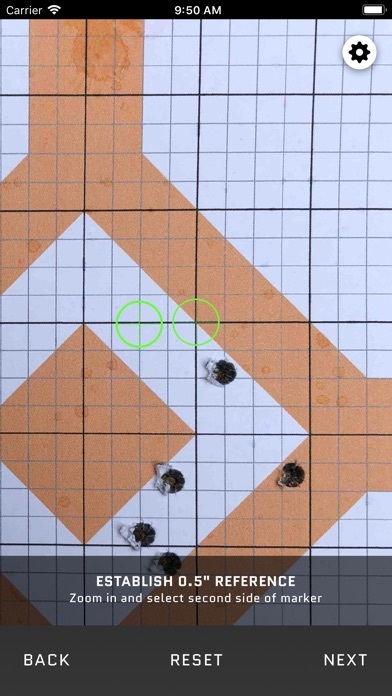 I shoot Flo-Green color target dots, same as impact marker, can’t seen marker when I move it over my target dot. Thanks for a wonderful app, it’s the best app I’ve got this year! Happy to see the new additions/tweaks to the app!! Perfect app for enthusiasts of all skill levels. If you’ve tried other apps, but couldn’t figure them out, try this out. Easy to understand, easy to use, and there’s a great community of users to answer any questions. Plus the developer is very responsive to any issues or suggestions. Can’t recommend enough. Just be warned, the app works so well, you’ll have your whole friend group making you be the one to run down to the targets and mark their grouping! Very easy to use. Reliable. Would like to see an update that marks the center of the group, as well as multiple groups, for Optimum Charge Weight tests. I’ve been following the development of this app from a distance for a while now. This initial release is very solid! Best feature for me so far has been the calculated adjustment to zero. 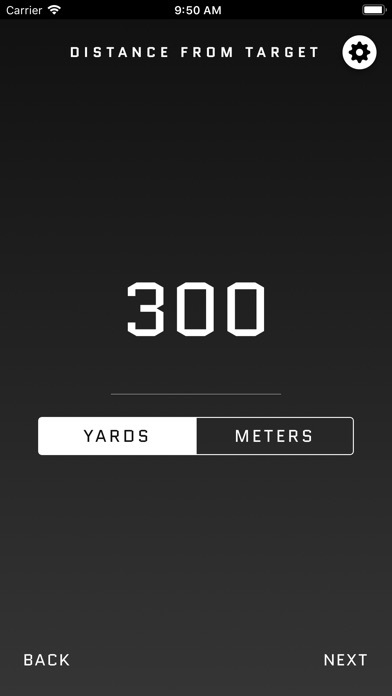 I’ve been measuring groups with calipers for a while now and this app makes it so easy. Either take a picture or upload old photos and get group sizes. Best app I’ve bought in a while. In this industry, people want what they want and no frills/no BS. For an MOA calculator, this gives you exactly that. Easy to follow instructions, clean design, and clear interface. This app has a lot going for it. I like that it doesn’t try to do too much. A few minor tweaks, and it could be near perfect. 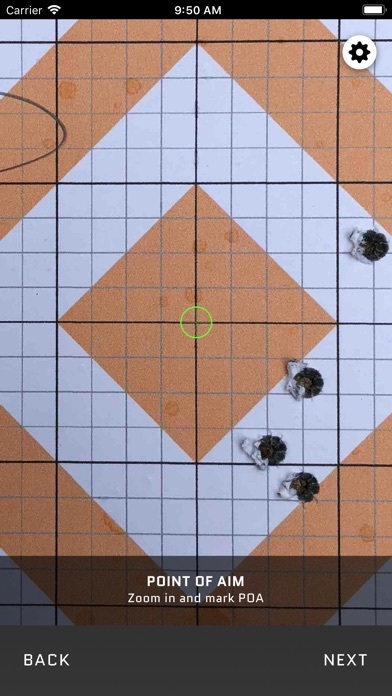 First, the centering crosshairs are simply too fine to stand out against a white background (target) as you zoom. I suggest making them slightly bolder/heavier. 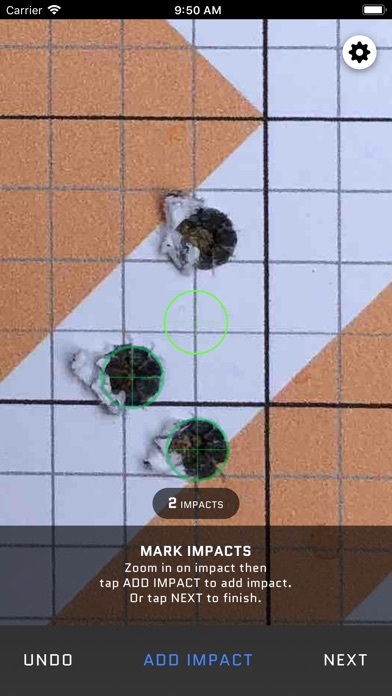 Second, once you selected the caliber, and you’ve set your 1” reference on your graphic, the crosshair’s outer circle should scale to the actual diameter of the bullet. Otherwise, you’re forced to interpolate the center as you move the small circle around, and it makes marking POI much harder. All in all, a solid app that will prove very useful. Great app, simple to use, spent all night going through my saved target pictures and using the app! Cant wait to see what the first update will be.